For as little as $14.95 / month we can get you started with your Mobile e-commerce venture. We offer Mobile commerce gateway connections. 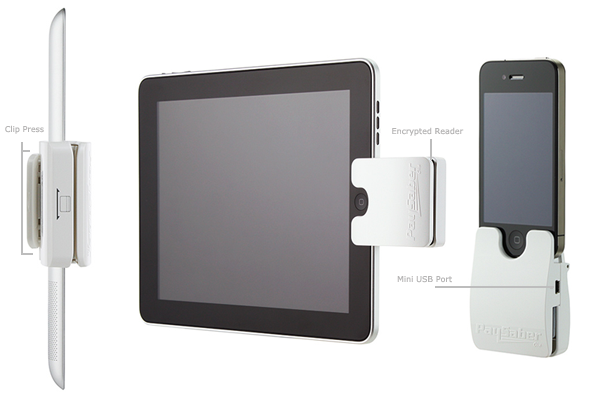 This will enable your your Smart Phone and IPad to swipe cards instanty And get the advantage of LOW swiped card rates. Lower than the Square. Built-in to the PaySaber for easy and secure swiping capabilities. The swiper reads level 1 and level 2 card data which is then encrypted at the time of swipe and sent over to the payment gateway for processing. Swiping a credit card during a transaction is important to keep a lower "retail" rate with the merchant bank. If you're using a device or software that does not support swiping, then you are paying a higher rate per transaction and the PaySaber can save you money with every swipe. 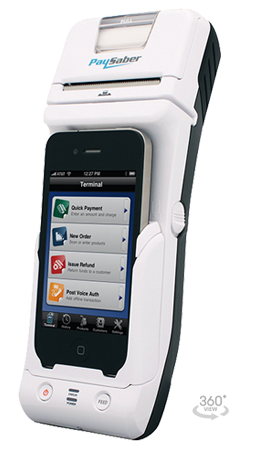 The PaySaber is more than just a credit card machine; the barcode scanner makes it a complete point-of-sale system. Inside the USAePay PaySaber software is the ability to control a complete inventory of products containing the barcode [or SKU] for every product. With a simple barcode swipe, businesses can easily scan their products at the time of purchase and PaySaber will calculate the total, taxes, discounts, etc. and have the order ready to be paid for. Barcodes are also printed on all receipts, so returns are as simple as scanning the receipt and clicking the process buttons. The PaySaber saves you time with every order. is built into every PaySaber device to allow merchants to print receipts or detailed invoices on-site for their customers. Studies have shown that even in today's world of email and electronic statements most customers prefer receiving a physical receipt when making a purchase from a company. Yes, the PaySaber still gives the option of emailing a receipt to your customers, but you can make your customers feel even more secure by offering them a printed receipt as well. PaySaber's receipt printer is a 2.5" thermal receipt roll which can be purchased at most stores or point-of-sale suppliers.